Having a lot of cultured, soaked, sprouted and lacto-fermented foods around is a wonderful problem to have since these are viagra no prescription incredibly nutritious and beneficial to consume. Sometimes, though, it can get a little bit challenging to find a place for everything that I want to store in my kitchen. 1) Keeping those items with live bacterial cultures a little distance away from each other. I’ve read that the different bacteria cultures can actually begin to intermingle and over time, weaken, when they are allowed to sit close to one another. 2) These foods do best in a slightly warmer part of your kitchen. If you’re anything like me, it doesn’t take long before all of the best counter real-estate has already been accounted for and then it’s time to get more creative. This is the most common place where you’ll find things “growing” in my kitchen. It’s just to the right of my stove (so it’s on the warmer side), and it’s a corner area under some cabinets. It’s not the most ideal space for doing cooking prep, so I have declared it to be my fermenting corner. 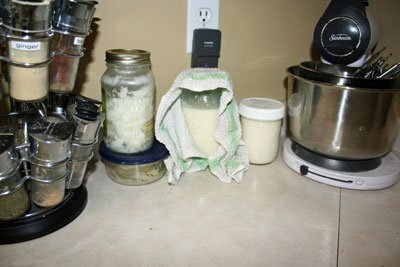 In this picture you can see some kefir with a cloth over the jar, and to the right of it, a lidded jar of creme fraiche. I allowed these to be beside each other because the creme fraiche works great with a lid on, and I am assuming that this helps to prevent the mixing of bacterial cultures. In case you’re wondering, the other two containers have butter and coconut oil in them. 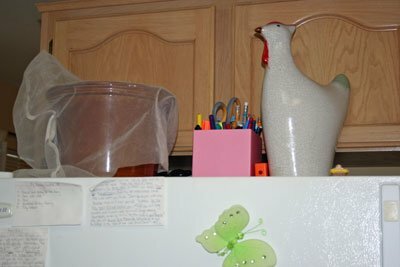 I move it up to the top of my fridge (another warm and out-of-the-way spot), to keep my chicken company. My husband and I have an ongoing argument about this little hen. I think it’s adorable, and he thinks it is downright ugly. Fortunately, the kitchen is my domain so this is one area where I get to have the final say in home decor. And no, baby Jesus (to the right of the hen) is not a regular part of my kitchen decor, except when we’re trying to locate all of the missing pieces of our children’s nativity set and he needs a safe place to stay, far from the reach of chubby toddler hands. Yet another spot where you might just find something fermenting away in my kitchen. Here’s a jar of lacto-fermented salsa up by my toaster oven. This is supposed to be a microwave nook, but we tossed our microwave many years ago. I do make sure to temporarily move my jars away from the heat while the toaster oven is on, then put them back up when I’m finished. This is where you would most likely find me making pickles, berry syrups, sauerkraut, or that sort of thing. I mentioned yesterday that I like to mark the top of my plastic mason jar lids with wipe-able markers. 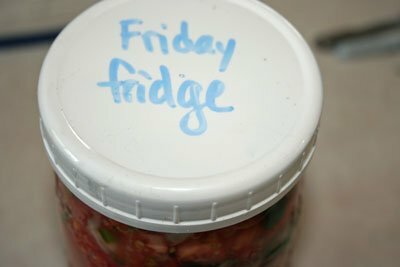 This salsa was made on a Wednesday, and so I wrote “Friday fridge” to remind me when to put it in the fridge. This simple little reminder system is a life-saver for me some days, when I can barely remember what my own name is! When I make kombucha, it has it’s own special place in my pantry cupboard. Kombucha takes longer than most ferments (anywhere from a week up to a month, depending on how warm my kitchen is). Normally I am too out-of-sight, out-of-mind to be able to store my ferments in a cupboard, but this one is a special case. I do remember reading about how Laura at Heavenly Homemakers stores her culturing buttermilk up in a high cupboard (like the one above the stove), and if you’re the sort of person who will remember that you put it there there then it just might be a great way to get some of these jars up and out of your way. Everyone’s kitchen is so different, and so are the ways that we women like to function in our own kitchens. The point of this was just to give you some ideas of what one woman does, and hopefully to help you get creative as you figure out how to make all these fantastic real foods work in your own kitchen! 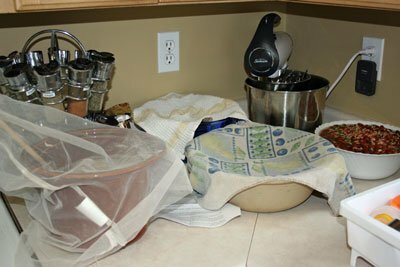 Where do you store fermenting/culturing/soaking foods in your kitchen? What types of creative solutions have you come up with, both for storing them and for remembering them? I am loving this series. Our kitchen is only about 65 degrees in the winter so I have found it a little bit challenging to keep ferments warm. My most recent favorite spot is the oven. It is electric, but does not have a light so I turn it to warm for a few minutes before putting them in and then turn it off. Then every 5-8 hours I check the temp and turn the oven on for a minute as needed. My kombucha I now have brewing in our storage bedroom where our baby now sleeps. We created a little cove next to the baseboard heater and found the temperature to be around 75-80 – perfect! .-= Shannon´s last blog ..Menu Plan – Grain & Bean Free =-. I”m looking forward to seeing what people suggest, as I am in the midst of redoing my pantry(ies). This post comes at a great time! .-= Wendy (The Local Cook)´s last blog ..Mostly Oats Granola =-. OK, a couple of questions: Why a cloth cover on the kefir and not a lid? I’ve always made mine in a closed jar. Also a MONTH for kombucha?? The directions I found on-line said 5-7 days. So am I fermenting enough? I’d hate to find out I’ve been doing it all wrong! I also did not know the cultures could mix, so thanks for that bit of info. @Ann, There’s no real reason for the cloth and not a lid on the kefir. Habit, mostly. A lid would be just fine. And I’ve read much shorter periods of time for making kombucha as well, but I keep it going until it tastes right and starts to get bubbly/fizzy, and I have had it take up to a month. Now, that was in the winter and it’s usually more like 1-2 weeks in the summer heat. I think that my starter might also have weakened a bit because I don’t make it regularly enough and I often store it in the fridge in between. I guess the way that I know my kombucha has gone long enough is that it tastes more sour/tart than sweet (which tells me the sugar has been “eaten” by the bacteria) and that is starts to get that fizziness that resembles carbonation. I just keep it going until it reaches that stage, and I know that many people are able to make their kombucha just fine in a shorter period of time. Dh built me a shelf over the stove where the under-the-cabinet microwave used to sit. When it starts getting too full, I use the top of the fridge too! I don’t have a ton of counter space to sacrifice. I’m only doing water kefir and yogurt right now but we’ve just moved to a new place and I’m having to be pretty creative since our house is a little on the chilly side. It’s not a big deal for the kefir, it just takes a bit longer than usual, but my yogurt won’t set unless I keep it in the only room that gets above 70 – the guest bathroom! Luckily we almost never use that one and it only takes one overnight about once a week. I haven’t found a good place for all my soaking bowls so I’ll have to check back on these comments to see if any ideas will work for us. The kitchen here is small but as they say, necessity is the mother of invention! If have just started soaking, fermenting, etc. so I am only ever doing 2-3 things at a time at this point. I have quite a bit of counter space and they are really deep, so most things just sit on the counter. I have used my oven to store things, as long as I remember to leave it off, but have forgotten about things in there, so the counter is usually best. 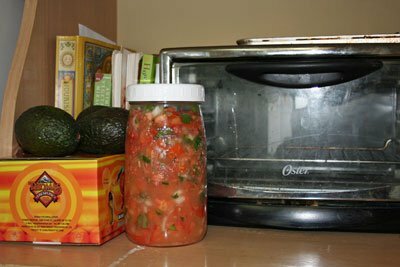 Could you share your recipe for lacto-fermented salsa? I think you wrote about that before, but I don’t know if you ever gave a recipe. @Shannon, Thanks for mentioning the oven, Shannon. That can be a really good spot as well, and it’s something that I use sometimes as well. My challenge is forgetting that I have things in there and then I start pre-heating the oven! I really weakened my sourdough starter that way, and have semi-ruined yogurt that way as well. Oops! This is just too funny. I posted yesterday how my kitchen looks like a science project all the time. With all the jars and bowls. I hope it is ok I added you to my links on my blog. .-= Elizabeth Q´s last blog ..Have You Had Your Pancakes Today? =-. I put my water kefir on my counter underneath some cabinets. My husband wants to build a wine rack for all the bottles (we have 2 dozen!). I have one “arm” of counter space that extends across from my stove, and any other food I end up making (sprouted grains, etc.) ends up there, or on my kitchen table overnight. I often soak beans, occasionally sprout grains, make water kefir, and the rest I don’t do often yet. We’ll see! It’s hard to have a “clean” kitchen when there’s always food going! .-= Kate´s last blog ..Eating Fat: How and Why =-. I have still not started soaking or fermenting yet but am wanting to get around to it as well as sprouting. I am very interested in sprouting grains for flours! Also do you ever use water kefir grains? I have heard of them but haven’t been able to find them. .-= Joy´s last blog ..Winter Wonderland =-. @Joy, I tried using them last year and I think I goofed up and they just didn’t work. I actually have some sitting around, waiting for me to use them, but we keep going on sugar-free diets so I have to put it off. I can’t wait to try them, though! @Joy, And I almost forgot… I got my water kefir grains from Cultures for Health. Great company with lots of good starters and cultures! aside from soaking grains occasionally for pancakes or muffins, I have not tried any of this yet…I am looking forward to the GNOWFGLINS course next week….looks like I better get clearing out some storage spaces for all the yummy food stuffs I will be making. Also, Stephanie, I had to laugh when I say your chicken and read your comments about you and your husband. I have a rooster in my kitchen that my wonderful God given husband just does not like……I even named him! LOL. .-= Jolene´s last blog ..Whole-y cow, & milk & grains…..oh my! =-. Thanks for the neat tips, I am a fellow learner and find encouragement in learning how others do things. We do saurkraut, kombucha, and sourdough regularly as well as soaking nuts/seeds and flour for baked goods…haven’t tried pre-soaking for cookies yet though because I’m afraid! LOL! One question: what is covering your sourdough? I have taken to covering mine with a tight-fitting lid (although you’re not supposed to) and have found it is SO much more active when I do this. Any advice? Sourdough bread is still not my strongest forte, so if you have any tips I’d love to hear them, including how to make sourdough more active. I do use freshly ground rye flour for feeding the sourdough and find it really helps. Any other suggestions? Thanks! I enjoy reading your blog! Keep it up! @Susan, The thing covering my sourdough is a mesh nylon bag. My mother-in-law found them somewhere for cheap, and she picked up a bunch so we (family members) could each have a bag to use to cover our sourdough. I would agree that sometimes a tightly-fitting lid can increase the activity. The other things that seem to help are using rye (as opposed to wheat, kamut, etc. ), using warm water when feeding the starter, keeping it in a warmer place (even in the oven with the oven light on), and just feeding it really regularly. I am honestly not that amazing at sourdough myself and still have lots of bumps along the way with my own starter and breads. Anyone else have any suggestions for keeping sourdough starter really active? Could you share your recipe for the salsa? I am new to your site, so please forgive me if I am just not up to speed here. Do you leave your sourdough out all the time? @Yolanda, I do usually leave my sourdough out. Every once in a while I take a break from making sourdough bread and then I store the starter in the fridge instead. It just takes a little while to get it going again when I’m ready to use it. I haven’t yet shared my salsa recipe, but I would be happy to share it soon! Thanks for asking! @Stephanie @ Keeper of the Home, Wonderful. Thank you! Since it is just me and my husband here now, my sourdough does not get constant use. I only bake bread maybe 2 or 3 times a month and make a few other things, so it sleeps in the fridge most of the time, but that is never a problem. Can I ask you a question? Where do you get those awesome, twistable, white lids for your glass Mason jars? @Marissa, I bought mine from my natural foods coop. I’ve heard that even places like Walmart or other big box or houseware places carry them, though. They are fantastic- I adore mine! I had to laugh when I read your opening lines. I feel just like that some days! I just had to comment when I saw that your sourdough crock seems to be just that–a Crock, as in a Crock Pot insert! I’ve been using mason jars for my kimchi, but I’d like something bigger. I see crock pot inserts at the second hand store all the time. What a perfect idea! beware of crock pot inserts as I have just learned a new bit of info: some brands have been made with a glaze that contains lead . . .
is this just hearsay? My source was another real-food blogger like yourself. I heard that the only brand w/out lead is Hamilton Beach ? ? ? Anyone else know of this? @Natalie, I don’t know for sure, either, but I have heard rumors of that as well. I wish I could find a way to know for sure!